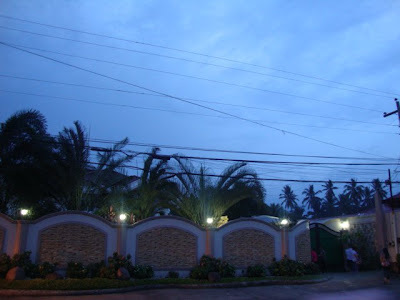 Businesses, a Golf course and mansions - these are some of GenSan's pride's, Manny Pacquiao's properties and assets that he acquired from being a World Boxing Champ. His fame brought tourism to my hometown in Mindanao which is General Santos City. I can see that a lot has changed in General Santos City. During my vacation last week, I went around the city and saw that the economy have progressed. Malls are being built, I saw a lot of new establishments and I was pleased. Their were now more jobs offered to the people in GenSan. Manny Pacquiao was indeed a hero of the Generals (that's what people in General Santos City are called) not only because of him being a boxing Champ but also for bringing jobs to the people in the city. When I was in GenSan, I went with the Vinoya Family in December 29, 2010 the day after Michelle and Jon's wedding. The Vinoya Family was born and raised in Manila. They wanted to see the beautiful places in GenSan and of course wanted to tour one of the mansions of Manny Pacquiao. Lainy was the tour guide since she knew much about GenSan. We had lunch at Southpoint Diving Resort, which is located in Maasim, Sarangani province (this where Manny Pacquiao was able to win as the Congressman during the most recent national election). It was I think about an hour away from General Santos City. Unfortunately, we did not bring swim wears so we ended up just taking pictures of the beautiful place! After that, we headed to the newly built Robinson's Mall in GenSan, they did some shopping. Again, took a lot of pictures and had our snack. It was almost 6 o'clock in the evening when we're done fooling around in the mall. So when we came to Manny Pacquiao's mansion, we found out that they don't entertain guests anymore after 5 o'clock in the afternoon. Too bad! We ended up just taking pictures outside the gate of the mansion! LOL! The Vinoya Family were of course got somehow disappointed because that was one of their agenda before going back to Manila. Hope you could share pictures of the food that you ate. That will be one delicious post for sure.